Preheat oven 350F. Cook pasta al dente according to package instructions and drain. In a medium bowl, mix together ricotta cheese, spinach mozzarella cheese, Parmesan cheese and egg. 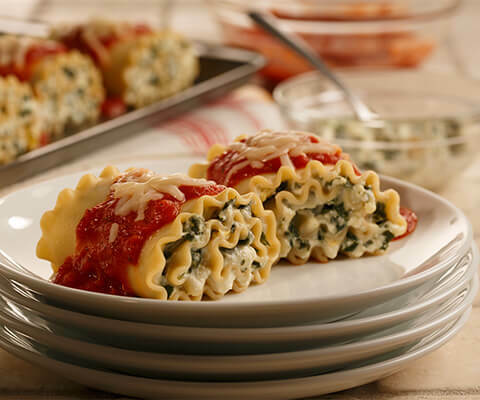 Spread about 1/3 cup of cheese mixture onto each lasagna noodle and roll up. Spread about 1/2 cup of Pasta Sauce into the bottom of a 13x9 baking dish. Arrange lasagna rolls in dish, seam side down. Spoon remaining Pasta Sauce evenly on top. Cover tightly with aluminum foil and bake for 30 to 35 minutes, or until heated through. Allow to rest for 5 minutes before serving. Garnish with shredded Parmesan cheese if desired. For a little extra kick, substitute Classico® Tomato & Basil Pasta Sauce with Classico® Spicy Tomato & Basil Pasta Sauce. Use shredded Asiago cheese instead of Mozzarella for a sharper flavor, if desired.